Johny Akinyemi needed a "miracle" and a new nation to get to the Olympic Games. 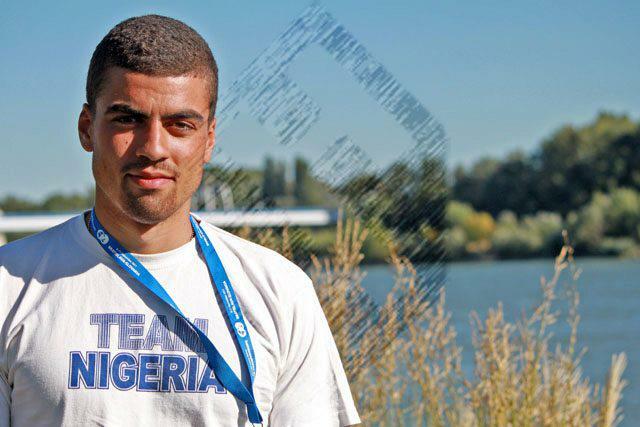 The 23-year-old will become Nigeria's first Olympic slalom canoeist at London 2012, having beaten the Beijing 2008 bronze medallist in a race-off to secure his place. But Akinyemi has lived and trained in the Cheshire town of Warrington all his life, as his accent attests, and admits he is "not the darkest Nigerian you're going to see, by a long way". He grew up as part of the British slalom squad's junior programme, racing alongside names he can now expect to face as rivals at the Games, but switched to Nigeria in 2008. "My dad's side of the family is Nigerian - my grandad came from Lagos - and when you grow up as a mixed-race guy in the UK, you go through a time when you almost 'discover' yourself and your roots," explains Akinyemi. "Around that time I was really looking into my Nigerian heritage, which is something I'm proud of, and I learnt a lot about myself. My identity came through that. "Warrington is not the most ethnically diverse place in the world and, when you're mixed-race, it's sometimes difficult to wrestle with your identity. But I'm proud to be Nigerian, and proud to be British as well." In early 2008, Akinyemi made his first trip to the nation he now calls his own, spending several hours at Lagos passport control trying to get his documents back. "I was initiated into Nigerian corruption straight away," he recalls, ruefully. Once in the country he discovered that, while slalom canoeing meant nothing to most Nigerians, his Christian faith certainly did. "Religion is really important to me. It's the main thing, the foundation of my life really," he says. "I went to church while I was in Nigeria and that was pretty intense. "They have big, big churches and there's a lot of shouting - it's really vibrant. I'm not used to that at the Baptist church I'm at [in Warrington], it's a bit more peaceful! "Everyone in Nigeria welcomed me with open arms. I was worried whether people would accept me when I switched but my name helped. When I said, 'I'm Johny Akinyemi,' they said, 'Ah, you're a Nigerian.' I'm privileged that they allow me to canoe for them." Akinyemi believes his faith has done more than build bridges for his canoeing career. "All of 2011, I was building up for my Olympic qualifier in South Africa. I knew it would be a straight race, winner takes all, between me and Benjamin Boukpeti, the Olympic bronze medallist from 2008," he explained. "I think, in South Africa, my religion got me through. A lot of people back in Nigeria, and in Warrington, were praying for me. "After the semi-final, where I came fourth, I was disappointed and the nerves were setting in. I took a step back, read some of the Bible - Psalms 18 - and I felt people's prayers giving me strength and peace on the start line. "I beat Boukpeti and I think God was with me on that run. I think of it as a modern-day miracle, because he's a really good paddler. When you see his muscles, you'll understand," he jokes. "I needed that extra." If Akinyemi is still cementing the connection to his new country then his rival Boukpeti's allegiance to Togo, for whom he won that bronze medal in 2008, is yet more tangential. Boukpeti was born and raised in France and had visited Togo only once, a trip to see his grandmother as a child, prior to the Beijing Games. 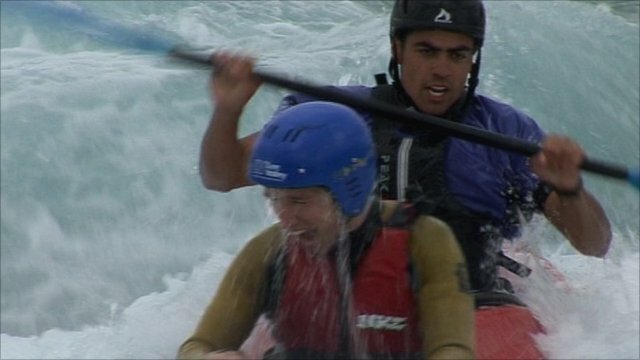 No other African has threatened the podium in Olympic canoe slalom. Part of that is through a shortage of appropriate facilities, and Akinyemi is determined to make a difference to the sport in Nigeria once London 2012 is over. "Nigerian slalom is very much in its early development stages and, at the moment, I'm the only athlete competing at an international level," he says. "The rest of the guys are in the lagoons of Lagos paddling and, when I go there, that's where I train. I do my weights and fitness in the national stadium, and paddle on the lagoons. "It's interesting to see - you look around and there are canoes everywhere in Nigerian heritages. On the lagoons you have villages where people use canoes as their main mode of transport. "After the Olympics, I'll go to Calabar [a city in south-eastern Nigeria] and see if we can find any white water to set up a club there. If we can just get the kids growing up around canoes into a competitive environment, and into the right kind of boat, then the future is pretty bright." Feel-good article; hope he succeeds in setting up the canoeing club. The country need more people like him willing to set up things for younger Nigerians, people willing to put others first for a change instead of the constant and grindingly boring moans from Nigerian people too lazy and unimaginative to get up of their backside. It is good to fill national vacuum. Litmus: Feel-good article; hope he succeeds in setting up the canoeing club. The country need more people like him willing to set up things for younger Nigerians, people willing to put others first for a change instead of the constant and grindingly boring moans from Nigerian people too lazy and unimaginative to get up of their backside. That is what I always say on this forum. Most Nigerians are too lazy to find something doing rather than to blame the president for every little problem. I am glad somebody is doing something in the name of Johnny Akinyemi. God bless your soul Johny. I have been wondering why Nigerians do not participate in so many of the games I see Aussies taking medals in. There still lots of sporting events that we need to tap into and develop to increase our standing on the medals table at one of these international tournaments. Johny, the nation is behind you. Please let him come to the Niger Delta and see potential Olympic gold medel canoeists there..
Small boys wey fit paddle shipp from Nigeria to London!! Thank God say ehn no forget Area!! Meanwhile some people wey just collect Visa yeterday don get accent, forget how to speak their native tongue!!.. The dude is so spiritual. Anyway I'm glad he's repn 9ja and I wish him all d best. Corporate bodies here should encourage him too by way of sponsorships(forget government), so we don't lose him to other nations. nice to know someone is representing. I want all Nigerians to be more positive like this guy. Nigeria needs a positive environment. Good roads, electricity, drainage and education for all. Basic needs and not the bleeping corruption tearing the country apart. One thing we fail to know, money is the least important thing in life. Its not a value all and why the Bleep do people run after non-important things. Wish you all the best.up 9ja,the best country in africa,we are no.1 and no country can be compared 2 us in africa. 9ja till i die! Naija man! Dem go knack wood if wood get puzzy. LocalChamp: In early 2008, Akinyemi made his first trip to the nation he now calls his own, spending several hours at Lagos passport control trying to get his documents back. "I was initiated into Nigerian corruption straight away," he recalls, ruefully. y u like to dey yab us all the time na? did bf cheat on u again? LOL can you just emajin. Let's go there and support this guy. I pray Johnny wins a medal at the games, I pray he floats the club and discovers world class talent. And Nigeria will become a force to reckon with. Because they have been in the so called developed world and know that the potentials in Nigeria is far greater.. If Osaze had chosen Russia, he would never have had a National team playing career.